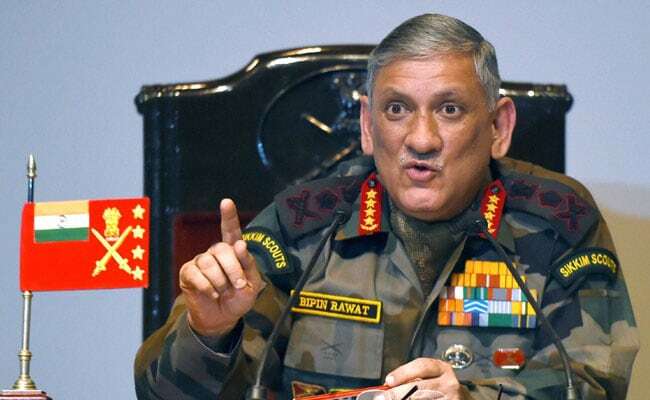 General Bipin Rawat said he is not hurt by the comparison with British General Dyer and that the author of the article, Partha Chatterjee, was trying to draw a reaction from "somewhere else"
New Delhi: Army Chief Bipin Rawat says he is not affected by those who have compared him with British General Reginald Dyer, who achieved notoriety after ordering the Jallianwalla Bagh massacre of 1919. The comparison had appeared in an article published in the CPM mouthpiece "Democracy", which has party chief Prakash Karat as its editor. The BJP has condemned the comparison. Academician Partha Chatterjee, who had penned the piece, wrote that the Army chief, by commending Major Leetul Gogoi's action of using a civilian as a human shield in Kashmir, "let down the high professional standards in the Army". "See, I am an Army officer. Just anything cannot affect me. You have to be prepared to face such... People can misinterpret (comments made by him)," General Bipin Rawat was quoted as saying by news agency IANS. "There is no need to react... It should not bother me. He (Partha Chatterjee) was trying to draw a reaction from somewhere else, " General Rawat was further quoted as saying by IANS. Asked if he was not hurt by the comparison, he said: "Not at all". He added that people should be left to judge. "People are the best judges; majority's decision will be right," he said. Mr Chatterjee's article appeared days after General Rawat, in an interview to news agency Press Trust of India, said the Army was facing a "dirty war" in Jammu and Kashmir which has to be fought through "innovative" ways. He had added that the main objective of awarding Major Leetul Gogoi, when a Court of Inquiry was finalising its probe into the incident, was to boost the morale of young officers operating in Jammu and Kashmir. Union minister Venkaiah Naidu, who voiced "total agreement" with General Bipin Rawat, has said the comparison with General Dyer is "atrocious". The British General had ordered firing at a crowd of protesters at Jallianwala Bagh, a public ground in Amritsar, on April 13, 1919, in which 379 people were killed. Though action was taken against him by the army, he was hailed as a hero in Britain.